Back in November of 2012, while serving with Bike Delaware, I posted a notice calling on bicyclists to attend a public workshop for "Route 72 Intersection Improvements". It is not clear how many bicyclists showed up, or what their comments were, because such information is (normally) not published or followed up. In fact, the biggest complaint we have about these workshops is that nobody really knows if their comments are even considered. In any case, in my own experience attending that night, public turnout appeared to be light. Now, 2 years later, we find ourselves surprised to learn that this project is moving forward, expanding this very popular bicycle route from 2 lanes to 4. Bike lanes are included, but what is now an 8'-10' shoulder will be effectively reduced to 4' (5' through intersections) for most of the length. The project also calls for curbs, which means that debris collection could be a problem, minus frequent sweeping of the corridor. In other words, even with marked bike lanes, the experience riding on Route 72 (Wrangle Hill Road) could end up even more stressful than it already is. 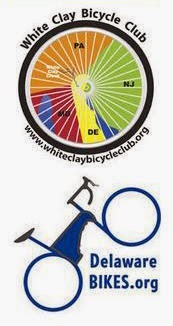 Advocates from the White Clay Bicycle Club and Delaware Bikes recently met with Anthony Aglio, our trusted Bicycle Coordinator within DelDOT, to discuss what - if anything can be done at this late juncture. We were relieved to find out that DelDOT is still open to suggestions to improve bicycle safety, and will take in our concerns. Narrow the center turn lane from 15' to 11', thereby adding 2' to the bike lanes on both sides. The result will now be 6' bike lanes, 8' when including the curb offset (which normally doesn't count). Instead of vertical curbs, use the standard sloped curb (or mounted, gutter pan, etc.) allowing bicyclists the option to bail out under extreme or threatening circumstances. Use bicycle-friendly rumble "stripes", as opposed to rumble strips. The latter tend to be offset from the white line, thus robbing valuable shoulder space, while the former are part of the white line itself. To accommodate the many bicyclists that ride to and from Delaware City and points east, connect the bike lanes through the SR1 ramps to the project limits, connecting them to the existing shoulders. Provide a 5' bike lane on McCoy. Where bike lanes transition back to the travel lane, place a Bikes May Use Full Lane Sign. 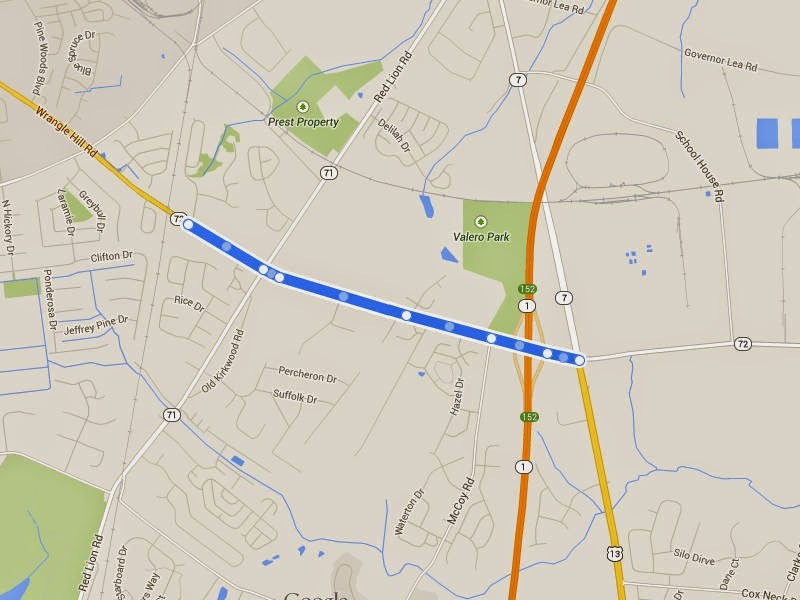 Above: Curbside bike lanes can be found in Centerville along Route 52, what may be the most popular bicycle route in Delaware. 2 lanes at 35 mph, however, is a much safer environment than a 4 lane 50 mph arterial highway. Hence, the need for a carefully considered Complete Streets design on Route 72.